The research project focused on capturing both qualitative and quantitative data. Site observations were also used, as the questionnaires did not satisfy the researcher’s desire for detailed input from the residents, the city officials, women’s groups and restaurant owners on their water use and water use habits. My aim was to gain an in-depth understanding of public engagement in water services, which required further probing depending on the responses. The qualitative and quantitative data were both predominantly collected through interviews, which provided an opportunity for discussion with the various research participants. A literature review was also conducted to find out what other researchers said about public participation in water conservation. The findings from the literature review showed that there was a need for empirical data in the design of comprehensive approaches that promote water conservation. A total of 82 households were therefore sampled and interviewed from 13 official suburbs of Masvingo City (see pictures below). Four key informants from the City Council were interviewed, as well as one from the National Coordination Unit (NCU). The NCU is responsible for the coordination of all water, sanitation and hygiene (WASH) sector activities, partners, and resources at the country-level. Additional key informants interviewed include the administrator of the newly established community radio station, HEVOI FM, and the Ward 1 chairperson of the Masvingo residents’ association (MURA). Lastly, focus group discussions were held with a church women’s group and restaurant owners (see pictures below). The household interviews were conducted with a questionnaire that had been prepared beforehand, and allowed for the inclusion of new issues. Interviews with key informants were guided by a list of questions also prepared in advance with flexibility for additional information depending on the discussions. In order to triangulate the information collected, focus group discussions (FGDs) were also held with a church women’s group and restaurant owners, using a set of guiding questions that had also been prepared beforehand. 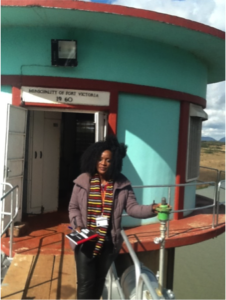 o The Masvingo city water service system is characterised by non-participation and tokenism constituting the bottom four rungs of Arnstein’s (1969) ladder of public participation. o The poor level of public participation exhibited by Masvingo City residents results in a significant loss of water. Residents are not practising water conservation at the household level despite the current water scarcity situation of the city. Non-revenue water is also increasing above the recommended limits. Beliefs surrounding the careless use of water and their consequences. While interviewees were aware of the consequences of lacking water, their beliefs were not matched by their conservation practices. Sociodemographic conditions in some households make water conservation quite difficult to achieve in situations where a household is occupied by more than one family and none of them have the power to advise the other to use water sparingly. A simple lack of concern about water conservation was shown by some residents who felt this issue did not concern them at all. o Effective forms of communication or participation such as information leaflets/fliers, the city website, media briefings, local community groups dealing with water service issues, water consumer councils, and public participation in regulation can allow interaction and feedback with the consumers. This needs to be upheld by city water utilities, which would allow them to achieve full adoption of water conservation practices. o Public meetings need to be held on a regular basis and be independent of any specific development so that an environment of trust can be established (Rouse, 2013). o Water consumer councils can be very useful in providing the public with a real voice on water issues, and if the water service drops below prescribed standards they can give the consumers a means of improvement (Rouse, 2013). o Regarding accountability, citizen report cards can allow the city council to solicit user feedback on the performance of the water services. Community score cards, which are a community-level tool that links service providers to the community and facilitates assessment of the services towards negotiated improvements, are also very useful in building the motivation of consumers to take up water conservation seriously. o Policy shifts are needed to incorporate effective and sustainable water conservation approaches that include the scaling up of approaches, such as pre-paid water meters which consider the most vulnerable members of society. o Failure to fully or properly implement some of the participatory tools for accountability, as well as the disregard for effective forms of communication and consultation with consumers, was blamed for the current economic situation of the country. The current situation forces urban city councils to prioritise hardware components over software components of the services. Hence, further research is needed to determine the best ways in which these tools can be incorporated into the day-to-day running of these city councils under such harsh economic conditions. o The key message is that low levels of public participation in the water service sector, as well as poor forms of communication from the city water utility, results in limited or no adoption of water conservation practices among beneficiaries (i.e. households or commercial businesses) of the water supply system. It was a remarkable experience to carry out this kind of urban research, particularly as someone with a rural water supplies background. I owe it to the generous help of the Weidenfeld-Hoffman Trust (WHT), my college, and the School of Geography and the Environment for their combined financial support of my research. I also want to singularly thank the Louis Dreyfus Foundation-WHT for their support, which has contributed to the fulfilment of my long-standing aspiration of becoming a leader in water resources management. I am now equipped with the knowledge and understanding of how to tackle the big water management challenges that face my country and other developing countries. Lastly, I want to thank the WHT family for the seminars, skills training and programmes they offered us during the year, which enhanced my leadership abilities, as well as the social networking activities, which gave me a home away from home.